The scent lingers for over two hours and it lathers up extremely easily. If you have trouble lathering then this soap will alleviate your concerns. Provides a slick surface for the razor to glide on as well as good protection. Just make sure to add enough water as Proraso can be a thirsty soap. Overall, it’s an amazing soap for the price. Very good soap, easy to lather up. smooth shave. Went on to buy further Proraso product. This soap is very easy to use, produces a good lather which reduces any irritation if you have sensitive skin and it has a subtle scent. This is my second bowl and along with the Eucalyptus in the green bowl are the soaps that I use regularly. I have tried some soaps that are over four times the price and found them ok but still went back to the Proraso. very happy with my purchases and your speedy delivery. Stocked pretty well but will contact you again for sure. Wonderful product, would recommend to anyone. If you are after a deep, satisfying and long-lasting sandalwood scent then definitely go for this soap. It’s really soft and really has worked wonders on my skin, which had a lot of issues in the past with a variety of products. One of the best out there for me! I’ve been using Proraso green with good results, but wanted a different scent. The Red gives a great shave with a nice subtle, but natural sandalwood fragrance. No menthol kick like the other versions (green / white). However, nice scent easy lather, and gets a great shave. I now use this or the sensitive white version, both, are really good products. This shave cream provides a rich and slippery lather, perfect for slicing through the whiskers with ease. My only gripe is the smell is not spectacular and not what I expected but I’ll try others in future. Proraso Sandalwood Shave Cream gives a wonderfully thick and creamy lather and is a joy to use, I even look forward to shaving! As yet I have not used the product, but have used Proraso shave soap before, and am highly satisfied. I use both the Proraso red and green, both are brilliant value, i find it very easy to get a creamy lather so don’t know what the previous poster is talking about ? I always get a superb shave, love the smell and have zero problems, perfect. 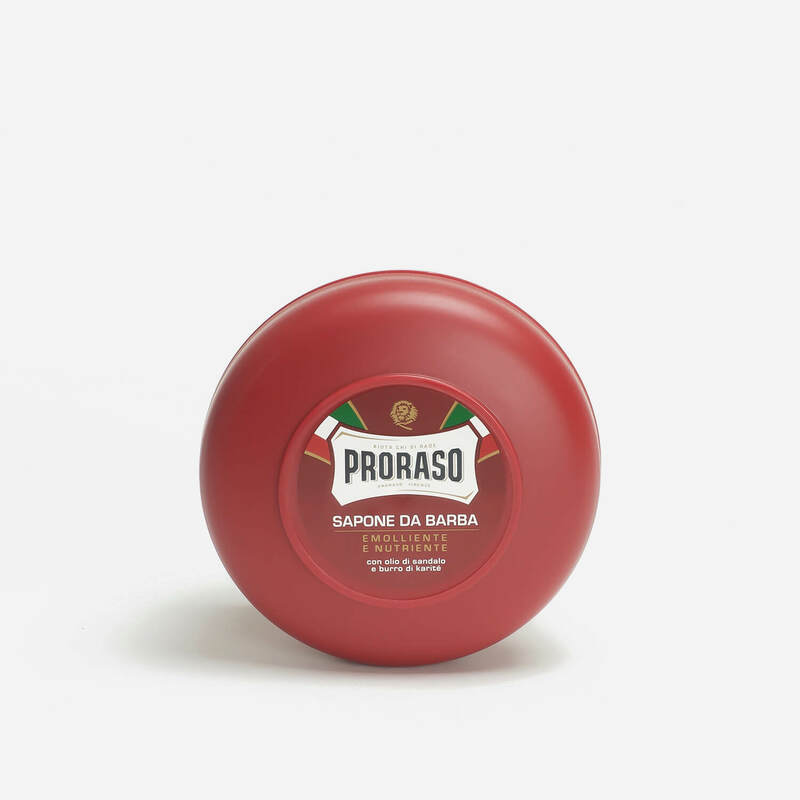 I really like Proraso Sandalwood & Shea Butter Shaving Cream Jar. Excellent quality. Was waiting to try this for ages as I have a tough beard, and was not disappointed at all its a lot creamier than the green with a lovely sandalwood scent and this stuff last’s ages I’ve had the green for 6 month and still got some left as always excellent service from Shave Lounge first class company. This is my first purchase of shaving cream and I have to say I am delighted. I exclusively face lather and find this soap lathers, lubricates and performs very well. It has quickly become the soap that I use every day and would not hesitate to recommend it.